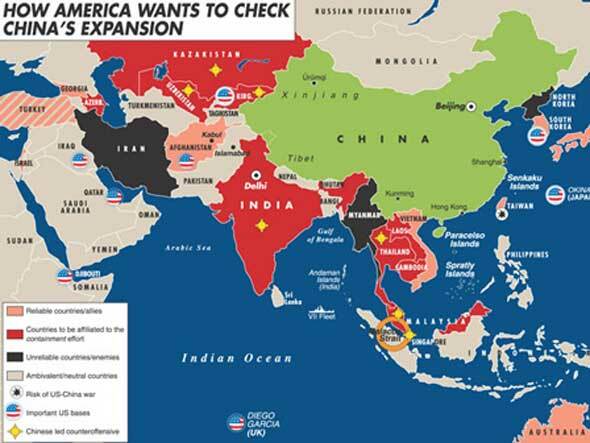 The “String of Pearls” doctrine encapsulated in a 2006 Strategic Studies Institute report, aims at co-opting, destabilizing and otherwise neutralizing nation states cooperating with China and enabling it to project power and influence along its long and vulnerable oil link to the Middle East. Starting in Africa, throughout the Middle East, into Central Asia and terminating in Southeast Asia, the United States has been conducting a widespread campaign of doing just this. TOI on Saturday that US intelligence agencies have confirmed to Indian authorities about the increasing presence of Chinese troops all along the LoC.While Pakistan too has described these reports as baseless, it is now well documented that Chinese troops have been around in PoK since late 2009 when they arrived in the Gilgit-Baltistan area supposedly to rebuild the Karakoram highway. According to Indian agencies though, these troops are no longer restricted to this area and that they are now also present in what Pakistan describes as “Azad Kashmir”. Pakistan in particular has jointly built a new port with China in the coastal city of Gwadar in the southern province of Balochistan. This port serves as a potential terminal for a north-south transit corridor to transport oil and goods directly into Chinese territory via the northern Gilgit-Baltistan region of Pakistan. It also serves the potential to host a Chinese naval presence. The US bid to interfere internally to disrupt this is hardly a conspiracy theory. 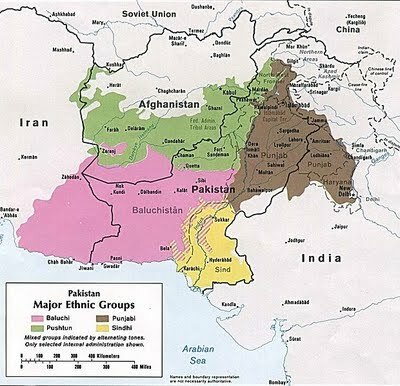 Globalist scribe Selig Harrison of the Soros funded Center for International Policy has published two pieces regarding the overarching importance of Pakistan in a broader geopolitical context and “suggestions” on how it can be solved. Hamid Karzai’s statement that he may switch sides and back the Taliban in the war in Afghanistan has rattled the nerves of the U.S. foreign policy makes from Washington D.C. to Kabul. And while the cost of war has been high thus far, some consider the U.S. position in Afghanistan vital to America’s China strategy. 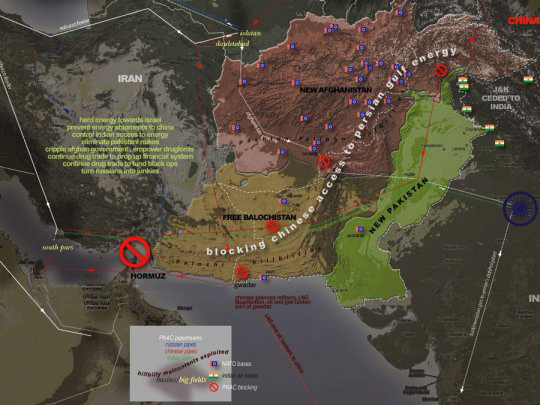 In order to fence in China’s influence, Afghanistan could be seen as a vital bulwark between a China-Iranian pipeline alliance.The U.S. would have lost a major bulwark in the presumed containment strategy on China. Simultaneously, faith in the U.S. government’s ability to back up its word in war would be undermined, which may suggest to other Asian states, like India and Pakistan, that they seek security backing elsewhere.